The Anaheim Ducks won a crucial Game 5 last night, topping the Los Angeles Kings 4-3. They’re in the driver’s seat with two chances to close out the Kings and advance to the Conference Finals. 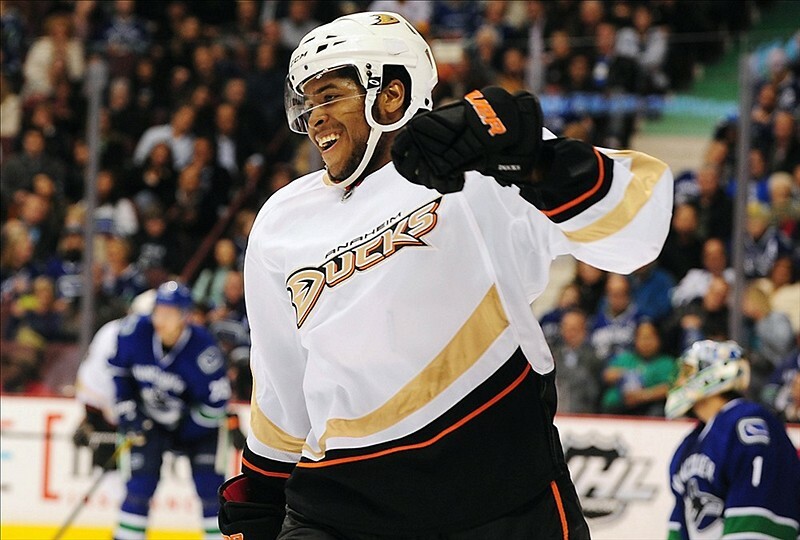 It’s official: the 2014 postseason is Devante Smith-Pelly’s breakout party. The 21-year-old was at it again last night, popping in another two goals. He’s averaged a goal every other game this playoffs, but it’s his dogged work away from the puck that’s equally impressive. His ice time is slowly increasing (he saw a season high 19:06 in Game 4, and is now around the 15 minute mark consistently), as is his responsibility. He’s the latest to audition for Getzlaf and Perry’s Third Wheel opening – and the gig is his for now. John Gibson stat watch: 5-0-0, 150 saves on 157 shots. Ducks fans need to keep expectations reasonable as enticing as the hype train is. He won’t pull a Ken Dryden this postseason, though it is difficult not to be excited about his potential. Gibson was the #2 ranked prospect in the Hockey News’ latest Future Watch behind Jonathan Drouin, and has justified that ranking (maybe he’s number one at this point?). Gibson faced 14 shots a period; the Ducks as a team were outshot by 20 last night. 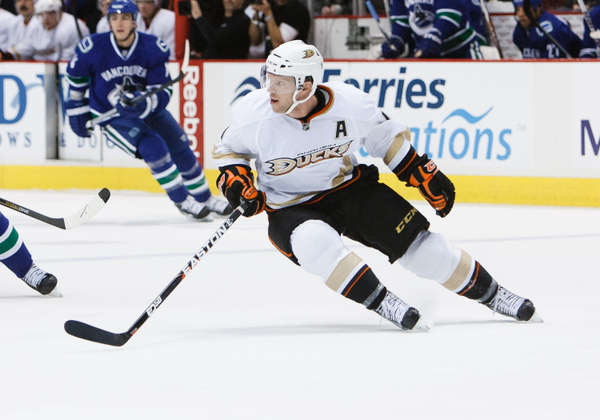 Sticking with the kids, Sami Vatanen has been a revelation since being added to the lineup in game three. He brings speed and excellent puck skills, particularly on the power play. The Ducks have won every game since inserting him into the lineup. Anze Kopitar, who had his point streak snapped in Game 4, was back to his old ways with a helper. Marian Gaborik continues to be a force, adding another two goals to his monster spring. It’s safe to say the pending UFA played himself to a nice contract this offseason. His eight goals leads all playoff scorers. Mike Richards continues to be abysmal. Absolute non-factor, and coach Daryl Sutter is treating him as such: he played a season-low 9:50 last night. Stick a fork in this guy. The Ducks were a lot more aggressive and assertive last night, probably the first time they looked confident playing the Kings. They played more passive the first few games, and there’s definitely a sense of belief they can skate with the powerhouse Kings. They’re playing with the same swagger as they had during their massive winning spree in the regular season – everyone is handling the puck with authority. The emergence/assurance of Gibson is playing a big role in this turnaround. The Kings, on the other hand, were uncharacteristically sloppy. For a heralded defensive squad, their play in their own end was atrocious. Their turnovers cost them the game too; three goals could be attributed to turnovers and poor decision making last night. Eleven players recorded points for the Ducks last night. Their depth scoring has always been their strength, which they haven’t received enough of this postseason. Great idea by Sutter to reunite the Jeff Carter-Tyler Toffoli- Tanner Pearson line. Having Carter skate with some younger blood is rejuvenating – he plays with a lot more edge and skates harder. Hopefully Bruce Boudreau keeps Daniel Winnik in the lineup. Just loves what he brings to a playoff team: size, grit, smarts, and most importantly for the Ducks, faceoff acumen. Saku Koivu is the only regular Ducks forward who has yet to find the back of the net these playoffs. He’s due. The Ducks can eliminate its Southern California rival in Game 6 on Wednesday at Staples Center.